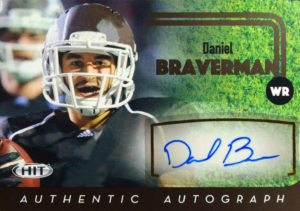 Daniel Braverman was an outstanding receiver for the Broncos of Western Michigan- where he finished his final college season in 2015 with a career-high 1,367 yards and 13 touchdowns. He was selected by the Bears in the 7th round of the 2016 NFL draft. Expected to compete as a slot man, Braverman lacks nothing for the subtlety and skill required to play at the NFL level, but his size (5’10”, 177) may get him jammed out of plays. He didn’t make the Bears final regular roster for the 2016 season, but was signed to their practice squad instead. The team promoted him to the regular season roster in November, but he didn’t see any substantial game action in 3 games. In early 2018, Daniel signed a futures contract with the Kansas City Chiefs.